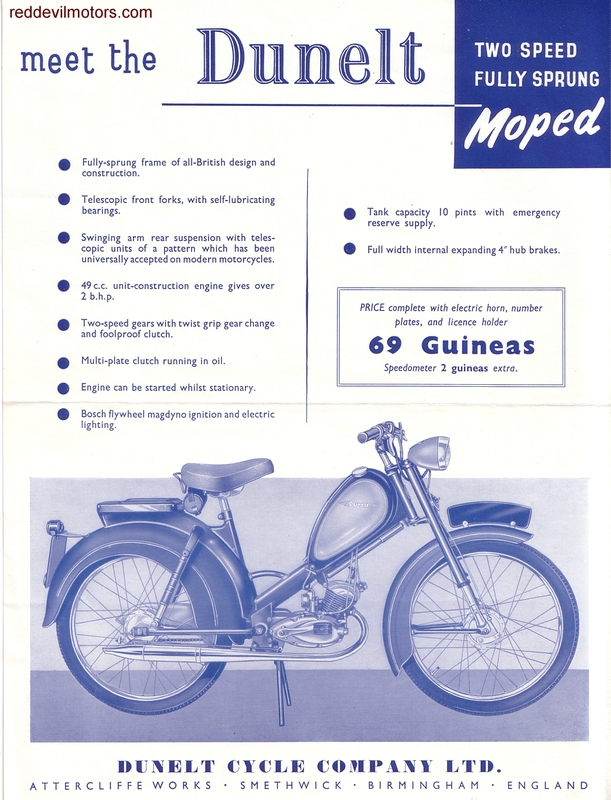 Single page flyer from 1956 for the Dunelt moped. Pre-war the Dunelt brand had been known for an innovative range of supercharged two strokes. In 1935 Dunelt quit motorcycle production and in 1937 they sold out their bicycle brand to Raynal. Raynal were in turn bought out by Tube Investments in 1950. TI were, of course, also the owners of the Raleigh bicycle brand. Dunelt branded bicycles were available through until the sixties when TI dropped the name. Through the fifties several prototype mopeds with the Dunelt brand were made by TI, the last of which is the below. The 1956 Dunelt used a German Rex two speed engine and apparently never made it in to full production. Of course by this point all Dunelt was to TI was one brand in their large portfolio of names in British cycling and motorcycling. 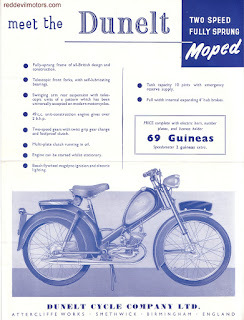 The Dunelt moped was not dropped altogether as if you look carefully there is a clear link to the Phillips Gadabout. The earlier Gadabouts were rigid framed devices but there was a springer frame prototype fitted with a three speed Rex unit that bears more than a passing resemblance to the Dunelt. More about the Phillips Gadabout on the Iceni CAM site. The penultimate tranche of snaps from a fine weekend spent at the Vintage Revival. A few short movie clips thrown in for good measure too. Pavel Malanik's extraordinary scratch built Torpedo replica. traditional methods. There's not a trace of cnc to be seen at all. As it was the year of the ABC here's an ABC racer. A pair of Harley J based board trackers. A very lovely and very early FN. BSA Model E ready to circulate. Replica penny farthing type device. An ABC out on the track. A pair of Bedelia cyclecars pass by. This Moulton mounted cyclist kept up a really good pace. parade was one of the most fun by far. You can't take yourself too seriously in a Velocar! Sunbeam and Harley v twins. And finally a BSA Model E 770cc v twin. Slightly blurry snaps but worth posting none-the-less. 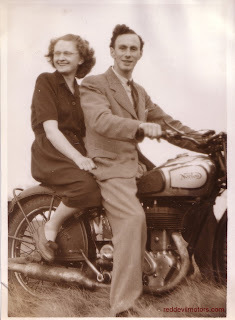 Same pillion and different riders posing on a Norton 16H. 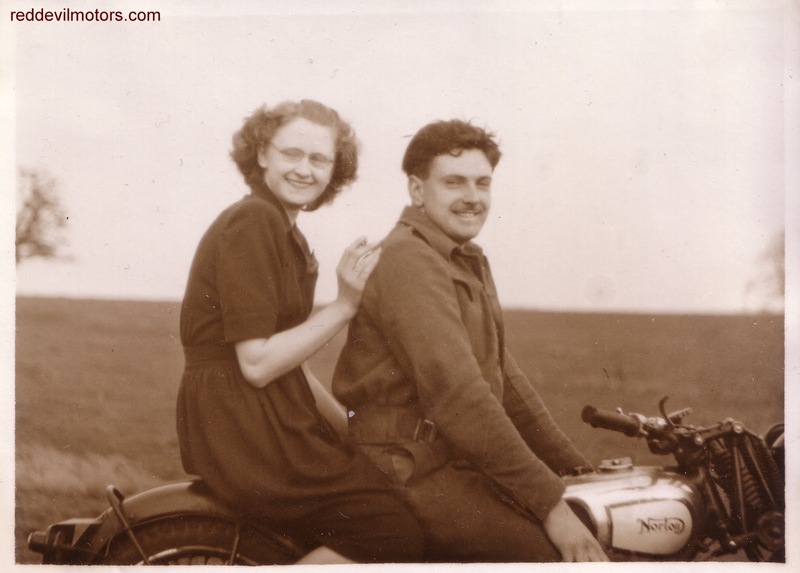 From the looks of the clothing style and chrome tank on the bike the pictures were taken in the late thirties. Having taken the fairing off the Beemer R80 combo all the sidecar couplings are exposed to be tweaked. 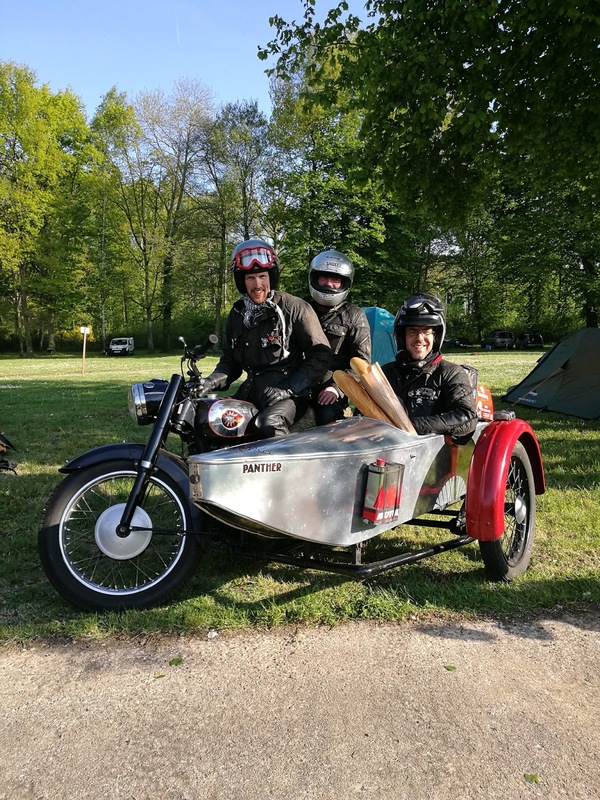 Since buying the bike I felt that there was a little bit too much flex between bike and sidecar. I'm not sure if some flex is a good thing in a combo or not but instinctively I feel it should be as rigid as possible. The naked look exposed a broken lower fixing at the front which I replaced with a new BMW frame mount from Watsonian I had that was kicking around the workshop from a previous project.That stiffened up the front a good bit but the rear still felt a little springy and the front could do better. A few years back I picked up a cheap bucket full of sidecar fittings at a local auction. In the way of the compulsive hoarder I knew they would come in useful some day. As indeed they have. A rummage around yielded the fixings to add a fifth mount at the back, then I realised that I could even add an extra at the front too so why the hell not? I felt that the rig steered slightly to the left and had a little too much love for the gutter so before adding the new mounts I gave it a spot more lean out and took it for a test ride. Improved but I don't really have a benchmark for what a really good combo rides like. This however feels pretty good to me. One negative result of taking the fairing off though is a weight bias off the front and to the rear which gives the front end a few low speed wobbles. Previously it didn't need any steering damper, now I reckon it could do with one. Sidecar mountings truly are a dark art! Details on the extra mountings with the pictures below. 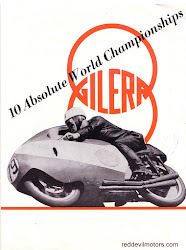 The result is a truly rigidly mounted sidecar. No worries there. It handles pretty well but improving one thing has highlighted issues elsewhere. Those rear shockers are pretty dreadful, the sidecar one too. Funny how these projects grow! or fail? What price style? And the other front quarter. I've got the geometry correct. returned so on they went again. c1937 James Sports Ace Light Roadster ladies. As a sucker for lost causes I couldn't pass this by. It's a James ladies cycle that has been turned into 'wall art', or willfully vandalised as some might say. Now I'll freely admit that there are a lot of bicycles in this world, you can't save 'em all but it seems a bit sad to take the hacksaw to something rare and unusual that has survived for the last eighty odd years. So here we are now. A James ladies model, if I am correct its full name is 'Sports Ace Light Roadster ladies model' and it is dating from c1937. In being prepped to hang on a wall anything not metal was taken or cut off and put in the bin, so no tyres, rubbers, saddle cover or cables. 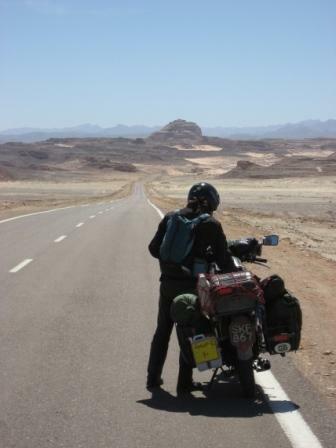 The bike was slimmed down to make it hang flat: this meant that a hacksaw was taken to the handlebars, left hand pedal and even the saddle was slimmed down. There's not a lot of paint left, possibly it was stripped to give it more 'character' and it has had a quick splash of clear coat. Note how the James sits uncomfortably close to that wall! I do believe though that it is a bicycle worth saving and the plan is to resurrect it without going in too deep moneywise. James cycles were always nicely made, high quality devices and this particular one has several unusual features. Most noticeable is James' own two speed planetary crank gear system, something that they offered as an option on most of their cycles from the veteran era onwards. The brakes are of rather unusual cantilever design and the front mudguard has a very elegant spearpoint. lever that matches going spare please get in touch. Changer for the two speed gear. 'The Famous James' lamp bracket. Even the saddle has been clipped. and very photogenic to boot. certainly does wear it's clothes just so. built up in a style that I guess you might call rat rod cyclemotor. projects, enough on the go already! Chinese cyclemotor engine. It looked the part and ran nicely. Sweet detail on the cyclemotor petrol tank. Detail on a Bedelia cyclecar. to put it that way..
Drive belt on the Bedelia. And rear view. An incredibly narrow track. And the full beast. Looks like fun! Unusual to see a blue Indian. Unknown and very diminutive cyclecar. The drive arrangement on the Villand in close up. This garish early veteran says 'Fulmen Helvitia' on its crankcase. Quadrant though I wouldn't perhaps go as far as to paint it yellow. Koehler Escoffier veteran era ohv v twin. Gorgeous. Another Monet et Goyon Automouche. Wall Autowheel motor in a willfully odd frame. I like it though. somewhat peculiarly leaves the handlebars unsprung. looks to be very original and perhaps unrestored. a period style and the end effect is very nice. Very grand veteran New Hudson v twin. was in exceptionally original condition. Neracar in front of the Rene Gillet. Stunning AJS R10 combo as seen out on the track. top spine of the frame is one large casting.